BMW has 450 Mini E electric cars running in a yearlong trial in metropolitan New York, New Jersey and Los Angeles. FRANKFURT -- Early next decade, BMW of North America plans to sell an electric "megacity car" as a subbrand of BMW, similar to the brand's M high-performance cars. But further details are skimpy. BMW already is preparing for that launch. Its yearlong trial with the Mini E electric car has opened the auto marketer's eyes to the maze of regulations facing plug-in electric cars. "We are learning a heck of a lot just about the sheer infrastructure," says Jim O'Donnell, CEO of BMW of North America. "When we bring out another electric car, we will be in a great position because we know all the wrinkles." There should be more cars on the roads. 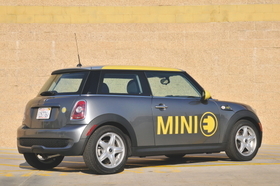 But after more than six months of addressing regulatory hurdles, Mini has yet to get approval to install more than 30 additional fast-charge boxes in New Jersey. With a 240-volt box, the Mini E can be recharged in three hours rather than the 21 hours needed using 110-volt power. "If you are in a house with a normal supply and you want to bring a 240-volt [charger], you have to have an agreement from the power utility," O'Donnell says. "New Jersey is the most difficult because there are so many local authorities." An inspector from each municipality has to approve the installation to make sure it complies with local codes. The cost of the box ranges from $1,500 to $1,800. The box had to be approved by Underwriters Laboratories Inc.
What O'Donnell calls "the New Jersey problem" is compounded because "all the components are certified, but they say the system isn't certified," he says. A BMW spokesman says the Mini E experience is a prelude to a more widespread launch of electric vehicles. "We are dealing with only three metropolitan areas of the United States," he says. "Think about when you start to build the national network and all those local codes."